The three-year strategic plan “Vision in Action”, launched in September 2016, has two equally weighted targets: profitability and solvency. The Group is on track to achieve the targets of the plan in 2019, thereby confirming the relevance of its business model based on independence and diversification (read “SCOR Investor Day 2018: SCOR is powering ahead”). The Group achieved its targets in its five previous strategic plans, between 2002 and 2015. Normalize the asset management policy as market conditions allow over the plan by aligning it to the upper mid-level risk appetite of the Group, reducing the very high level of prudence that currently characterizes the investment portfolio. An optimal solvency ratio in the 185-220% range (percentage of SCR)2. The P&C division, SCOR Global P&C, is well positioned to pursue sustainable annual growth in the 3% to 8% range (of gross written premiums) over the plan by: i) further developing the US franchise towards clear Tier 1 reinsurer status, while consolidating its position in international markets, ii) building the Channel Syndicate to sustained profitability, iii) transitioning SCOR Business Solutions (SBS) towards a customer-centric model and expanding the sectors and products offered to large corporations, and iv) developing the MGA3 platform to promote new business channels using the P&C division’s infrastructure. SCOR Global P&C anticipates a net combined ratio of 95-96% over the plan. The Life division, SCOR Global Life, pursues the strengthening of its market position, building on its leadership position in the US market, enhancing its strong EMEA position and expanding in fast-growing Asia-Pacific markets. SCOR Global Life will continue to manage and optimize its in-force book, expand longevity transactions and enhance its Global Distribution Solutions capabilities. Meanwhile, the Life division will develop in China, Japan and South East Asia. SCOR Global Life anticipates a technical margin of around 6.8% to 7.0% p.a., while anticipating annual premium growth of between 5% and 6% over the plan. The Asset Management division, SCOR Global Investments, will normalize its investment policy, by reducing liquidity to the target level of 5%, by closing the duration gap between assets and liabilities by the end of the “Vision in Action” plan and by benefitting from additional degrees of flexibility in its asset allocation. The Group expects an average annualized return on invested assets in the range of 2.5% to 3.2% over the plan. “Vision in Action” will also attain a new degree of sophistication in terms of the Group’s risk and capital management. The retrocession strategy, ALM4 and risk management will be further fine-tuned to support business developments. 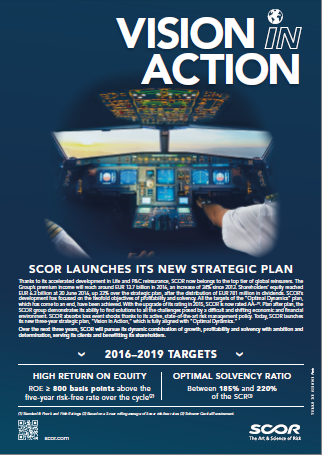 At its annual Investor Day in Paris today, SCOR presents its new three-year strategic plan, “Vision in Action” covering the period mid-2016 to mid-2019. SCOR reaffirms its independence and acknowledges Covéa’s decision to withdraw its proposal on a potential combination.